A living donor kidney transplant usually involves a donated kidney from someone you know, such as a family member, friend or co-worker. Genetically related family members are most likely to be compatible living kidney donors. You and your living kidney donor are evaluated to determine if the donor's organ is a good match. If not, there is another option available: paired kidney donation. Paired donation, also known as "paired exchange," may be an option when a donor and intended recipient have incompatible blood types, or when the recipient has unacceptable antibodies against the donor's tissue antigens. In paired donation, two or more organ recipient pairs trade donors, so that the recipients get organs that are compatible with their blood type. 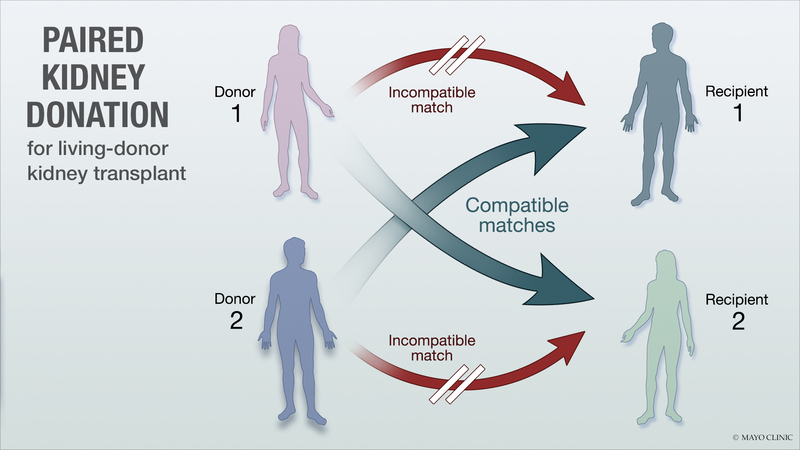 A nondirected living donor also can participate in paired donation to match incompatible pairs. On the next Mayo Clinic Radio program, Dr. Carrie Schinstock, a Mayo Clinic nephrologist, and Kay Kosberg, a Mayo Clinic nurse who coordinates the paired kidney donation program across Mayo Clinic's Arizona, Florida and Rochester campuses, will discuss the paired kidney donation program at Mayo Clinic. Also on the program, Dr. Amir Khan, a Mayo Clinic ophthalmologist, will explain what causes eye floaters. And Dr. Pashtoon Kasi, a Mayo Clinic medical oncologist, will explain changes in colorectal cancer screening guidelines to prevent the disease in younger adults.